Note that for small (2×2 and 4×4) boards the solution is unique and follows Golomb's proof. For larger boards, viz. starting with 8×8, this is no longer true: there is a good deal of solutions. However, some thinking is still required to tile the board and, more often than not, careless tiling will produce 1 and 2 squares pockets. 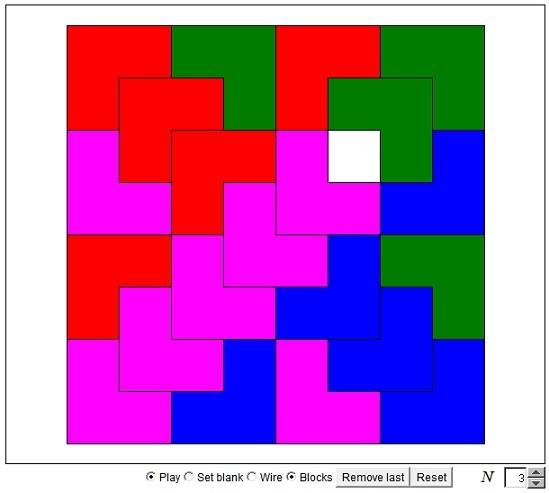 Another applet provides additional insight into the tiling with L-trominoes. Interestingly, we run into an entirely different situation if we try to cover the chessboard with straight trominos. Now, we'll have to consider very carefully which single square may or may not be removed!